The first half of the 2015/16 Bundesliga season will go down in history. A whole host of records were smashed in one of the most spectacular Hinrunden of all time. But who were the standout players? 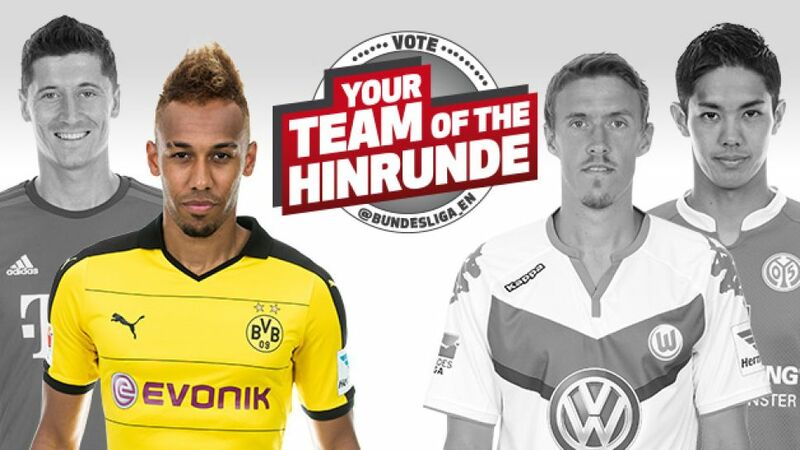 You have decided Pierre-Emerick Aubameyang should help spearhead your Team of the Hinrunde. It has been quite a few days for the Borussia Dortmund star. The Bundesliga's leading scorer was recently voted African Footballer of the Year, and has now received the backing of the bundesliga.com and bundesliga.de Twitter users. Despite fierce competition, Aubameyang soared clear in the @bundesliga_EN poll, claiming nearly 60 per cent of the vote. He was pushed closer by FC Bayern München striker Robert Lewandowski in the @bundesliga_de vote, but still edged out his former BVB team-mate by six per cent. The winner is the man with most votes from both the @Bundesliga_EN and @bundesliga_de polls combined.